This 200-acre property, protected in 2017, is located just south of Brownsville near the headwaters of Courtney Creek in the upper Calapooia Watershed in Linn County. 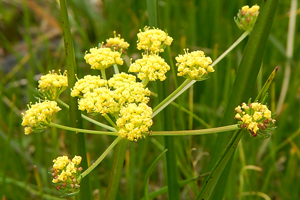 In addition to extensive wet ash forests, prairie, and wetland habitat, this site has one of the largest populations of the endangered Bradshaw’s lomatium left in the entire Willamette Valley, and the protection of this land will go a long way towards future recovery efforts. 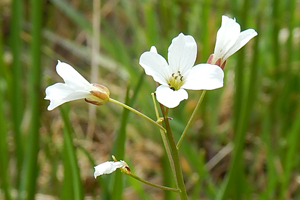 The property consists of primarily mixed forest and prairie/meadow habitats but is noted for its extensive wet ash forests and hydric meadows that contain extensive populations of native plants including camas, Bradshaw’s lomatium (ESA endangered) and numerous grasses and rushes. These areas are also important habitat blocks for resident birds (willow flycatcher, Western meadowlark and orange-crowned warbler) and large mammals (elk, bear, cougar, etc.). This area is a transitional ecotone between the lower Cascade coniferous forest and lower valley prairies and wetlands, hence is a confluence of biological resources from both ecotypes. 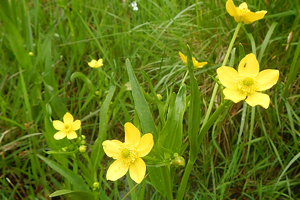 Current and future benefits include protection of nearly extirpated habitat types, seasonal wetlands, wet prairie and upland prairie that provide ecological functions (food, refuge, breeding sites, substrate etc) for amphibians, rare plants, fairy shrimp and other invertebrates, grassland birds, migrating birds, federally listed plant species (Bradshaw’s lomatium) and species with exceptional cultural values (camas sp). 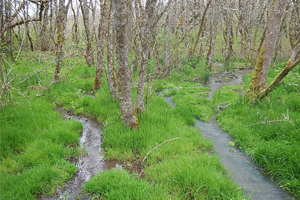 The wet ash forest and open wet prairies typical on the Courtney Creek property are remnants of once extensive expanses of these habitats in the eastern foothills of the Willamette Valley. 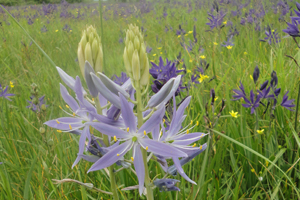 The Coburg Hills area is a nearby, ecologically significant area that has drawn considerable attention because the plant and animal communities in this area include a number of federally-listed species (Kincaid’s lupine, Fender’s blue butterfly, Bradshaw’s lomatium) and numerous species of concern such as Western Bluebirds, Western Meadowlark and Peregrine Falcons. The Courtney Creek Property is on the northern edge of the Coburg Hills and an extension of this important conservation area. The permanent protection of the Courtney Creek property was enabled through strong support from the prior landowner, as well as critical funding from Bonneville Power Administration through its Willamette Wildlife Mitigation Program, in partnership with Oregon Department of Fish and Wildlife. Greenbelt also benefited greatly from private donations to support our efforts to acquire this property. Access to Courtney Creek is limited to GLT-led tours and events at this time. There is no public access.